I’ve managed to get a new thing built today, suggested and critiqued by @bootifulgame, without whose influence my graphics would look a lot less coherent. 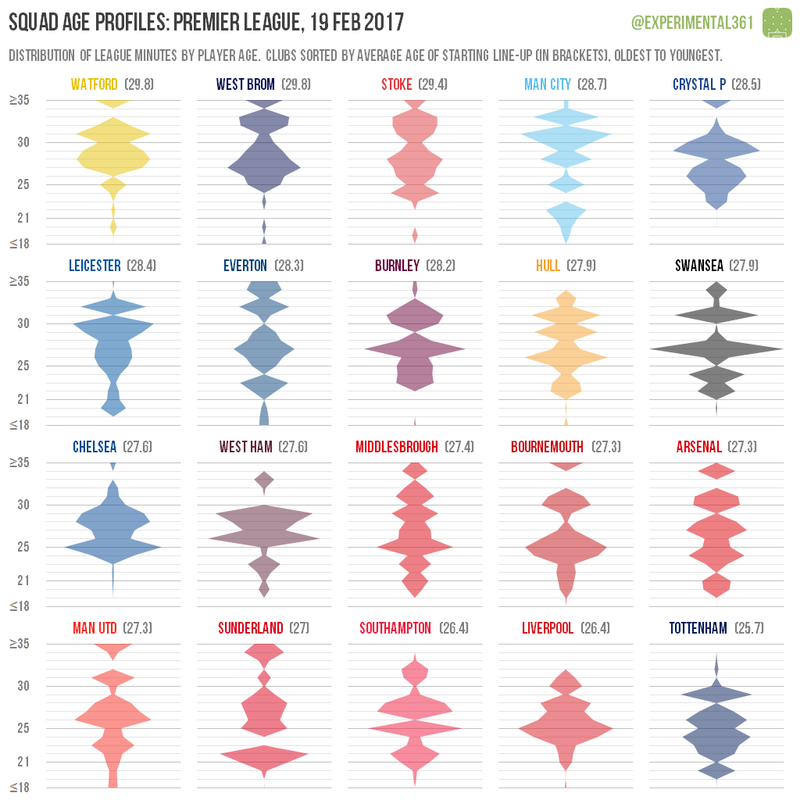 These are intended to give a quick visual overview of the age of players that each club has fielded in league matches using a technique very similar to “population pyramid” graphs, although I’ll freely admit that they’ve come out with shades of the Rorschach test. So Watford and West Brom have named the oldest line-ups in the Premier League so far this season – only a shade under 30 – and have fielded barely anyone under the age of 25. Man City are still conspicuously “older” than the other clubs challenging for the top four, with the fourth-oldest average line-up, although there is a promising cluster of youth coming through. The youngest side this season has been Tottenham, for whom Michel Vorm has been the only over-30 to feature (as both a 32 and 33-year-old). The title race is being contested between two teams of vastly differing ages: Brighton have fielded the oldest line-ups in the division and have barely used anyone under 24, while Newcastle‘s average starting XI is almost three years younger and rarely features anyone in their 30s. The youngest side of all has been Barnsley, whose chart looks like some sort of majestic gliding bird. The Tykes are one of only two EFL sides not to have deployed a 30-something in a league match this season. The two oldest sides – Northampton and Wimbledon are both newcomers to the division, having been promoted last year – so perhaps they’ve looked to experienced heads to help them adjust? Port Vale have a bit of a “generation gap” it seems: nearly all of their league minutes have been completed by players who are either under 24 or over 28. The youngest team in the division are the other not to have used a player in their 30s: Swindon actually haven’t fielded anyone over 26 yet and over half of their playing minutes have been accrued by players aged 23 and under. The oldest line-ups have been those fielded by Portsmouth, skewed by the ever-present David Forde (37) in goal and captain Michael Doyle (35). Morecambe‘s age distribution is interesting: a lot of players in their early 20s with a few veterans to guide them, including three of their four most-used players in Kevin Ellison (37), Barry Roche and Michael Rose (both 34). A less extreme version of this strategy appears to be in place at Crewe.